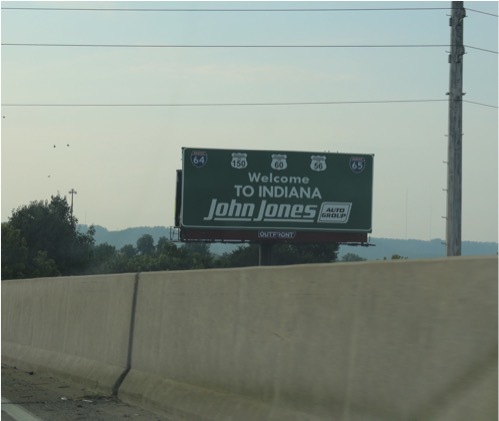 This post will detail the second half of our cross-country road trip, including the cost and pictures. In the first half, we drove from Durham, NC to Sundance, WY, with many stops along the way. In the second half, we made it to our destination of Seattle, WA, via Yellowstone and Grand Teton National Parks. Our motel didn’t provide breakfast, so we stopped at a grocery store to pick up a few more supplied after we left. 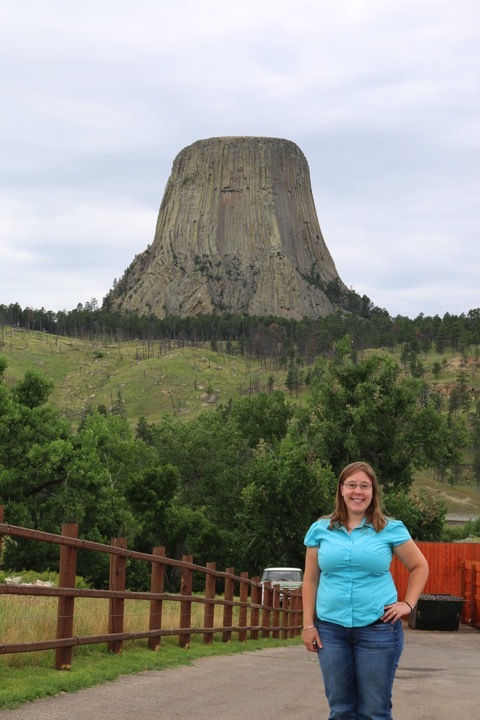 At the last minute, we added a destination to our day’s itinerary: Devils Tower. We drove up to the entrance to the park, but then decided we had enough nice views that we didn’t want to actually hike around it, so we resumed our drive to Yellowstone. That ended up being a great choice, because after a long day of driving we entered Yellowstone by the east entrance ($50 for admission to Yellowstone and Grand Teton National Parks). We had arranged for a hotel in West Yellowstone, so we drove across the park in the evening (East Entrance to Fishing Bridge to Canyon Village to Norris to Madison to West Entrance). 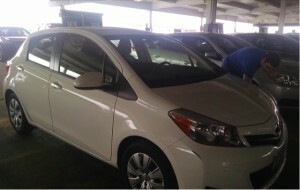 This gave us a bit of bonus time in the park, because we really didn’t expect to spend more than two full days in it. 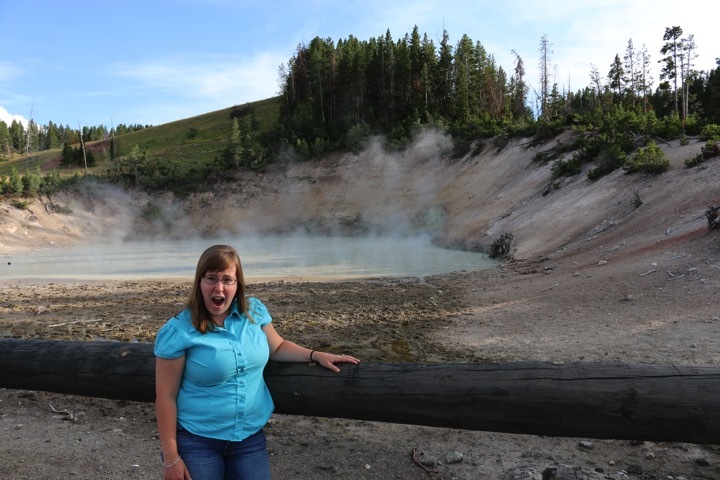 We saw Yellowstone Lake, mud volcanoes, hot springs, and a lot of bison. When the sun went down, we were inside the park but on our way to West Yellowstone. We pulled over to witness the most incredible sunset I’ve seen in my life. We checked in to our hotel in the late evening, where we planned to stay for three nights. We just stopped for lunch at a restaurant, and ate leftovers and snacks the rest of the day. 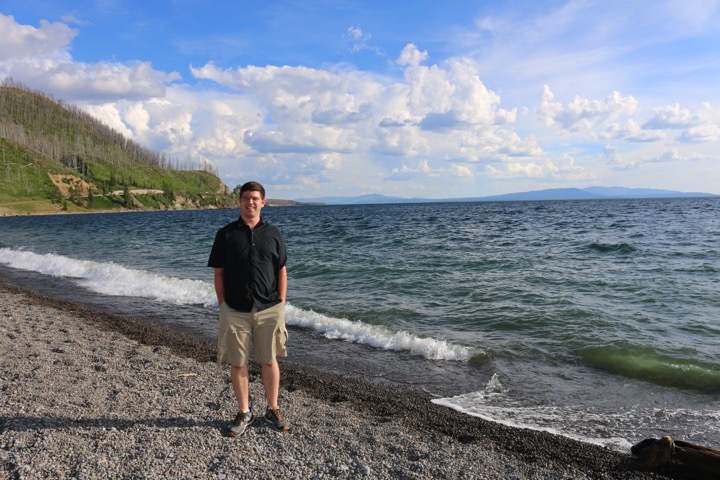 On our first full day in Yellowstone, we stayed on the southwestern part of the Grand Loop, largely between West Thumb and Madison. 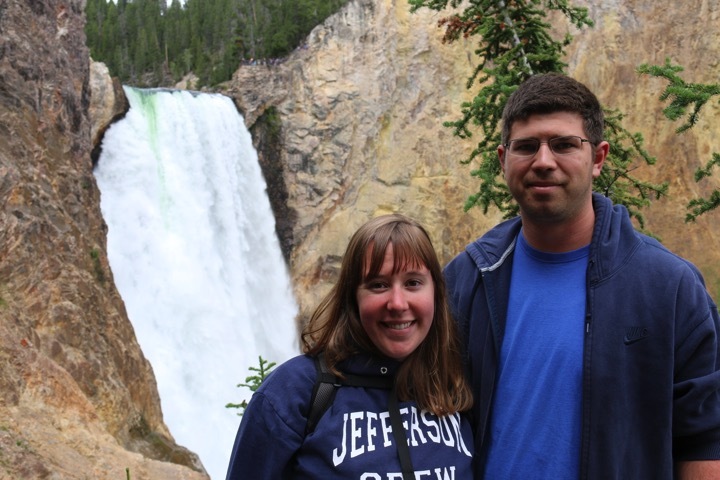 Our major activity for the day was hiking to Fairy Falls and another geyser. 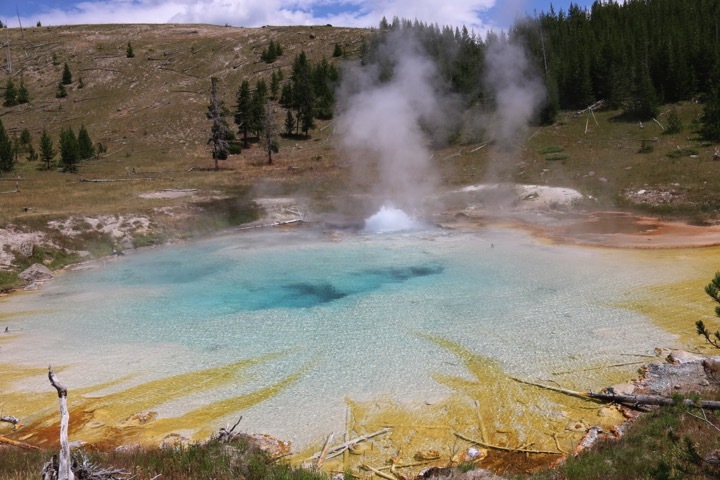 a geyser beyond Fairy Falls – a rare private experience in Yellowstone! 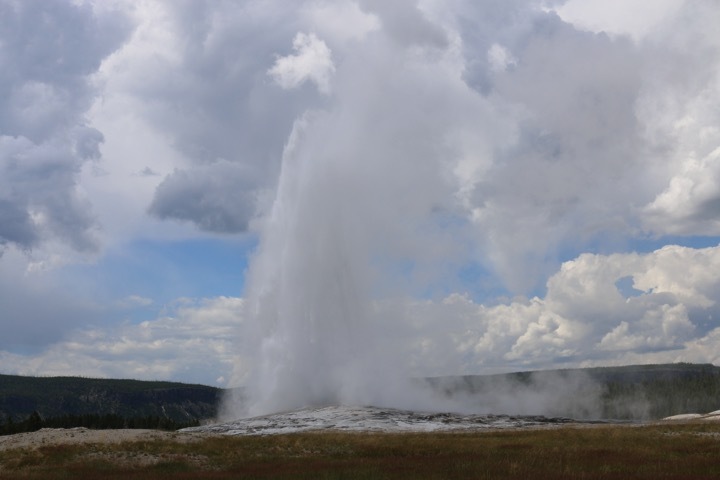 We also saw Old Faithful, returned to Yellowstone Lake, and went to various other geysers and hot springs. 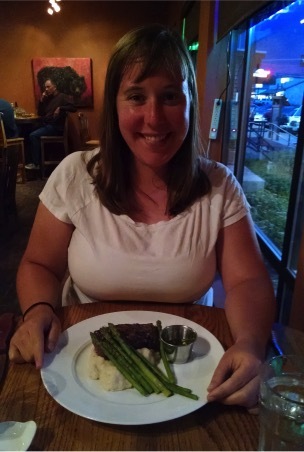 We ate breakfast in our motel room, packed lunches and snacks for the park, and had a late (great) steak dinner in West Yellowstone. Before we started our day, we did a couple loads of laundry at a nearby laundromat. 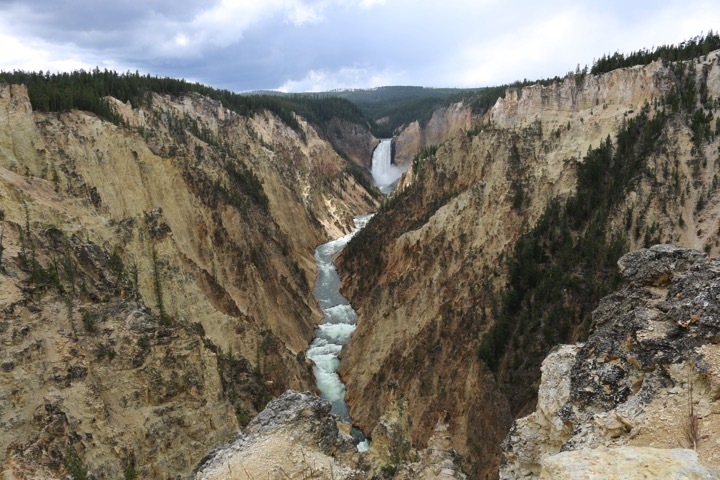 On our second full day in Yellowstone, we went to the northern part of the Grand Loop. We drove from West Entrance to Madison to Norris to Canyon Village to Tower-Roosevelt to Mammoth Hot Springs to Norris to Madison to West Entrance. Our major hike for the day was along the south rim of the Grand Canyon of Yellowstone. We started where we had a view of the upper falls, descended Uncle Tom’s trail (300 steps!) 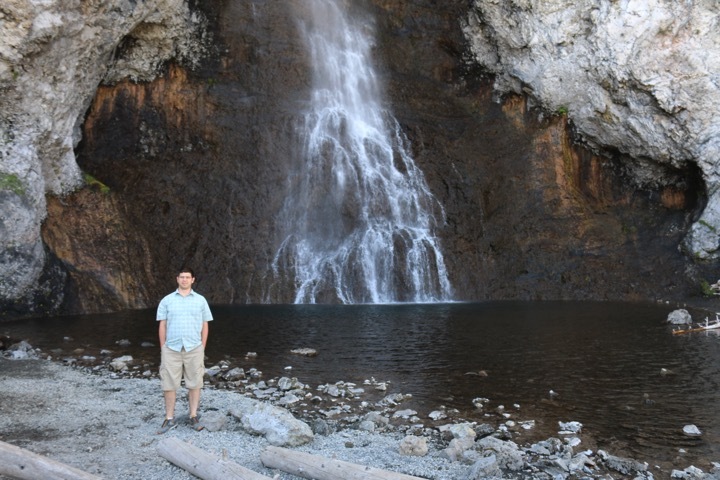 for a view of the lower falls, and the halfway point was at Artist Point, where we listened to a ranger talk. After that hike, we went to a museum at Tower-Roosevelt to learn more about the park, did a short hike to a waterfall, and walked all over the boardwalks at Mammoth Hot Springs. 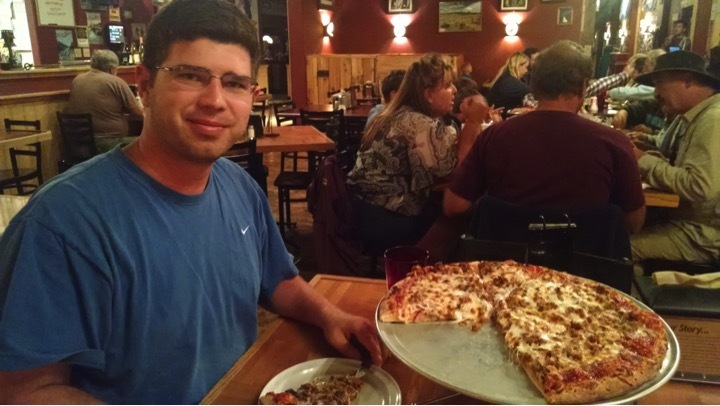 We ate breakfast in our motel room, packed lunches and snacks for the park, and had a late (weird) pizza dinner in West Yellowstone. Our last Yellowstone experience was to drive from the West Entrance to Madison to Old Faithful to West Thumb to the South Entrance. We stopped at Lewis Lake to check out the view. 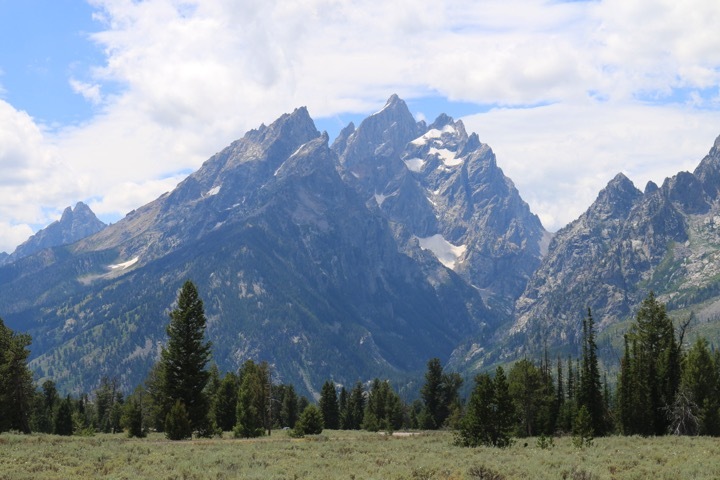 As we exited Yellowstone National Park, we entered Grand Teton National Park. (Side note: At Yellowstone, our admission slip was checked every time we entered the park. At Grand Teton, our admission, which we bought at Yellowstone, was never verified.) In Grand Teton, we drove from the north entrance to the south entrance along Teton Park Road. 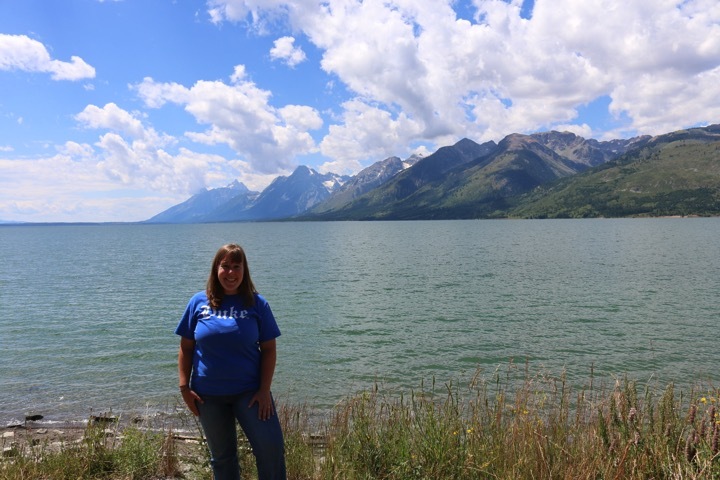 We stopped at several overlooks along Jackson Lake, admiring as we got closer and closer to Grand Teton and Mount Moran. 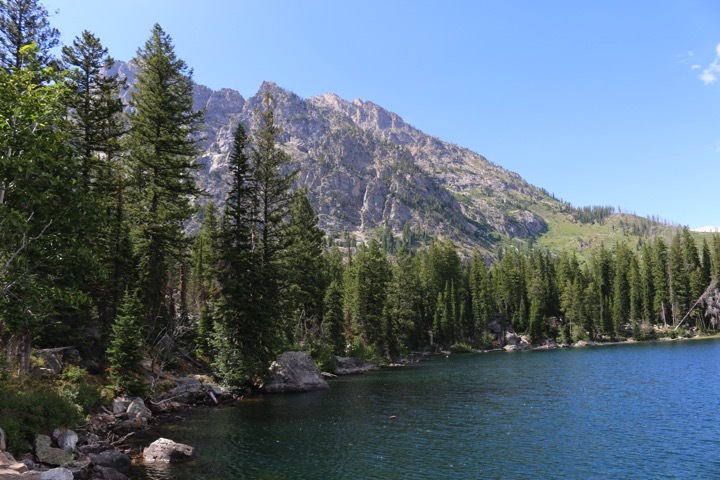 We also went for a short hike around part of Jenny Lake and took a water taxi from the end of the hike back to the origin ($18). Storm clouds were gathering, so in the late afternoon we exited the park and continued our drive to Idaho Falls. On this part of the drive we went over the highest-grade mountain of our whole trip, 10%. 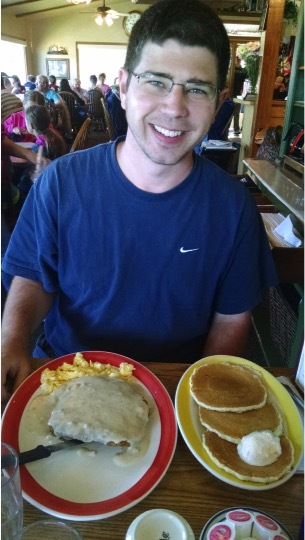 We ate breakfast at a pancake house in West Yellowstone, packed our lunches and snacks for our hike, and ate leftovers for dinner. This was the last day of our trip and it was a long driving day. 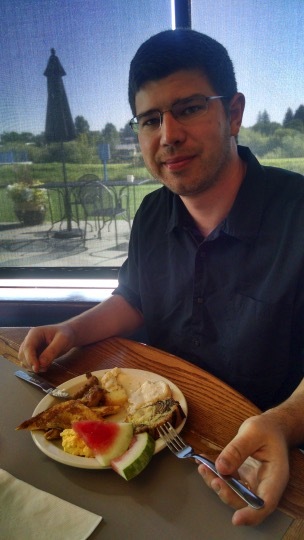 We had breakfast at our hotel in Idaho Falls, ate sandwiches for lunch, and stopped at Carl’s Jr./Hardees for dinner to bookend our trip. 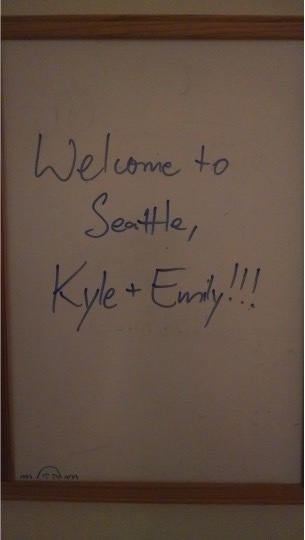 We arrived in Seattle around 9:30 PM, and were made to feel very welcome by the friend who let us crash with him that first weekend. So that was the second half of our trip! 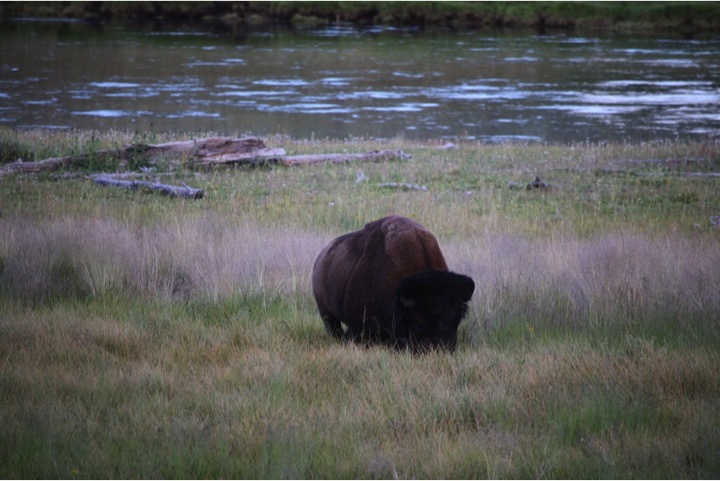 I obviously haven’t given enough acknowledgement and attention to all the things we saw and did in Yellowstone especially. We took over 1,200 photos just in those couple days, not to mention the rest of the trip! I think we struck a nice balance between doing short hikes to get some activity in and seeing the big ‘attractions’ that were near the road. Grand Teton also really surprised me with its beauty, though I think Kyle was expecting to be impressed because it was his idea to drive through the park. It really was a wonderful trip! Even though it was frustrating at times, it was very refreshing to be largely unplugged from the internet. It was also great to be together 24/7 and having new adventures. 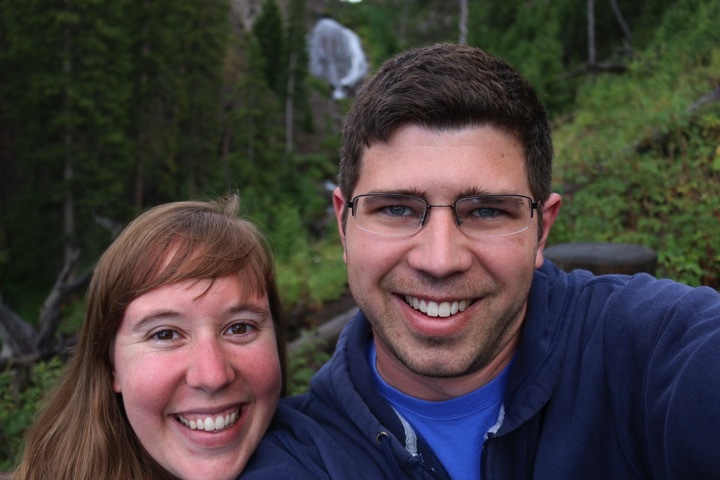 It was an awesome segue into our new life in Seattle! 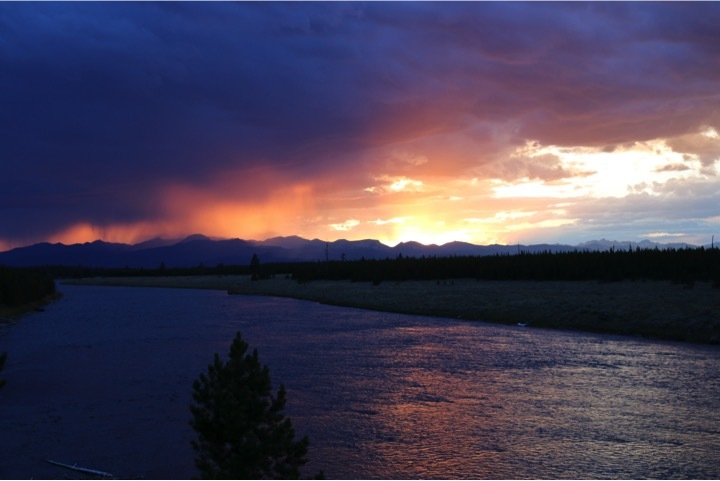 Have you ever visited Yellowstone or Grand Teton, and if so what was your favorite part? What is the maximum amount of driving you are willing to do in a day? Do you find being disconnected refreshing or frustrating? 3 Responses to "Cross-Country Vacation Part 2"
I’m surprised you didn’t buy a national park year-pass. More than $50, but there are several parks in Washington/Oregon you can visit with the pass. Plus, since it’s a sunk cost, there’s then no reason to not enter into national parks. Yeah, if we had planned this trip in advance I think we would have bought an annual pass. Too bad we didn’t research it before we paid our first fee! I think the annual pass was first offered to us at Badlands, and we assumed the the other parks would be the same price (bad assumption!) and we wouldn’t get up to the price of an annual pass from the few entrance fees. I think here in WA we’ll just have to see if we ever visit national parks, and consider an annual pass in an upcoming year. We usually wait until we go on a trip and then buy the pass at our first park. Some years, it has paid for itself; some years, it has not. We see it as an optional tax. The nice part is that we have gone some places simply because they were included and ended up enjoying those places. Olympic National Park and Oregon Caves National Monument (way southern Oregon) are my two favorites I’ve been to in that area. I think Mt. St Helens might fall under the pass, but I’m unsure — we had a pass for sure when we went there, so I don’t recall. Also not sure about Crater Lake, as that’s still on the ol’ bucket list.